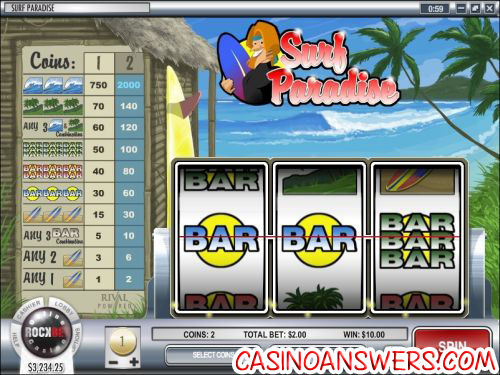 Surf Paradise Classic Slot Guide & Review - Casino Answers! Surf Paradise is a 3-reel, 1-line classic slot machine from Rival. You can play the Surf Paradise slot game at Superior Casino and Pantasia Casino. To play Surf Paradise, select a coin size of $0.01, $0.05, $0.10, $0.25, $0.50, $1, $2 or $5. Then hit “Select Coins” for one or two coins per spin. Alternatively, you can hit the column of the paytable at the left instead. You can bet as little as a penny on the Surf Paradise slot and as much as $10 per spin. To play the maximum 2-coin bet, use the “Bet Max” button. There is an autoplay option available for real money players. Whenever you’re ready to play Surf Paradise, hit “Spin” to start. The top jackpot on the Surf Paradise slot machine is the Waves symbol at 2000 coins for three of them on a 2-coin maximum bet. On a 1-coin bet, 3 Waves symbols are only worth 750 coins. The best value is in the maximum bet. The Trees symbol is the second best symbol, but three of them are only worth 140 coins. Payouts on the Surf Paradise classic slot machine are as follows (1/2 coin payouts in parenthesis): 1 Surfboard symbol (1/2), 2 Surfboard symbols (3/6), any 3 Bar symbol combinations (5/10), 3 Surfboard symbols (15/30), 3 Single Bar symbols (30/60), 3 Double Bar symbols (40/80), 3 Triple Bar symbols (50/100), any combination of 3 Waves and Trees symbols (60/120), 3 Trees symbols (70/140), 3 Waves symbols (750/2000). In total, there are 10 winning combinations on the Surf Paradise slot machine. If you want to ride the waves of the Surf Paradise slot machine, sign up at Superior Casino and get a $20 no deposit free cash bonus, $1900 in slots bonuses and much more! Are USA slots players able to play Surf Paradise for real money? Are Macintosh users able to play a Flash version of Surf Paradise? Yes, Superior Casino offers an Instant Play Flash casino for Mac users or players who choose not to (or cannot) download their casino software. If you experience any issues with the Surf Paradise flash slot game, download the latest version of Adobe Flash Player. Are there any special features on the Surf Paradise slot machine? No, you won’t find any wild symbols, multipliers, progressive jackpots, bonus games or free spins on the Surf Paradise classic slot. If you’re looking for a slot with special features such as those, try reading our Fixer Upper Interactive Slot Review.